The first world record size computation of a major constant on an overclocked computer. Update July 5, 2010: Shigeru Kondo has improved the record to 1,000,000,000,000 digits using the same program. Update July 17, 2010: Shigeru Kondo has posted digit distribution statistics on the first 1,000,000,000,000 digits. On February 20, 2010, I have sucessfully computed and verified the constant e to 500,000,000,000 decimal places. The digits are available for download here. Therefore, the timings may be a little bit inflated than if it were left alone. "Ushio" (from the Anime Series "Clannad"), or simply, "The Lanbox". D0 stepping, 4.2 GHz Linpack stable on Air cooling. It used to also be my primary computer, but my new laptop has taken over for much of that. None... This will most likely be a hand-me-down computer to my parents. About $2,300 USD. This includes the four add-on hard drives as well as all unnecessary luxuries such as the video card, the LED fans for aesthetics and the cooler for extreme overclocking. 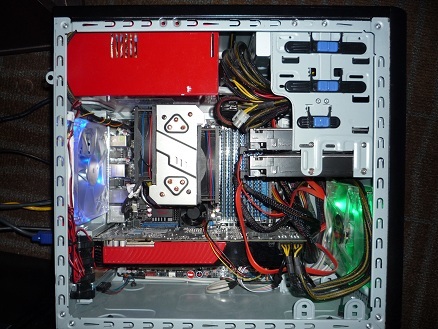 Prior to adding on the four hard drives (as well as the box that holds them), the total cost of the computer is about $1,600 USD. 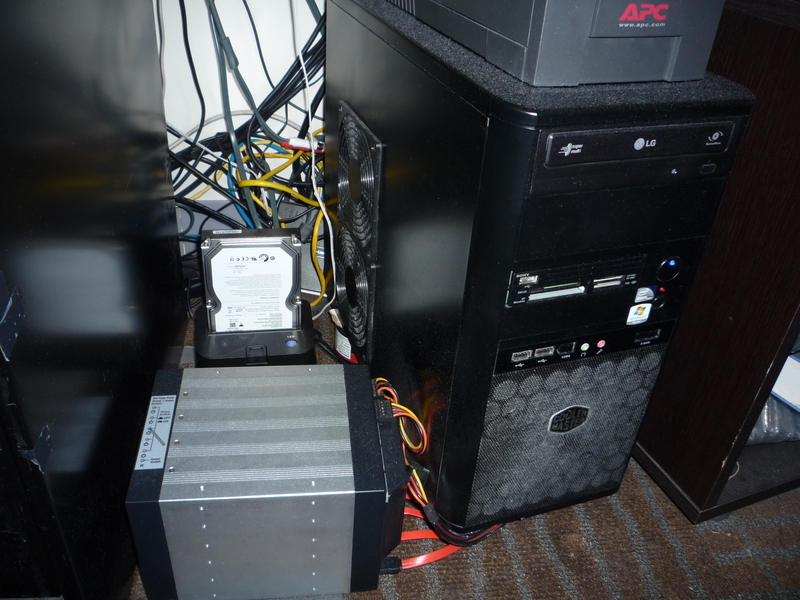 However, its small size means that it does not have the space to fit the 4 add-on hard drives that were used for the purpose of this computation. Hence the need for the 5-in-3 module. After the school year ends, I'll probably shove that 5-in-3 module into my workstation and return this computer to its purpose of being a portable lanbox for gaming-parties. At the end, two divisions were performed producing the binary digits as computed from the two formulas. Their results agreed. Two base conversions using different cutting and scaling parameters were then done to obtain the decimal digits. Those also agreed. After completing the second division, there was a minor issue that kept the program from writing the digits to disk. (Windows apparently does not accept directory or file names that start or end with a space.) However, the results of both computations were still preserved on the swap disks. So all it took was a simple fix and a recompile to resume the computation. No time was lost because this issue was realized well before it occurred. So the fix was prepared well ahead of time in anticipation of the failure. The method that was used for computing and verifying is far from optimal. There were plenty of places where the program could be improved - especially with the radix conversions. For example, two binary -> decimal conversions for verification is unnecessary as it is faster to convert to decimal once and convert back. Because e is a fast constant to compute (in comparison to other constants), the divisions and the radix conversions dominate the total run-time. However, neither of these operations were well-optimized in any way since the program was originally written for the much slower constants (i.e. Euler-Mascheroni Constant) where divisions and conversions are negligible to total run-time. Nevertheless, the program was efficient enough to perform the computation on a desktop within a reasonable amount of time. Not much here. Most of the arithmetic algorithms have been largely unchanged since last year's computation of the Euler-Mascheroni Constant. Virtually all the math and all the algorithms have been untouched. Nearly all improvements to the program since then were done at the implementation level. The only thing worth mentioning is that large multiplications on disk were done using the standard 3-step and 5-step convolution algorithms - which are the best known approaches for minimizing disk access. But even then, disk products are still highly limited by bandwidth. So for large products, every effort was made to try fitting them into memory. In such cases, the program will attempt in-place FFTs, CRT convolution reductions, and even go as far as sacrificing parallelism to fit a particular product in memory. Only when all else fails does it use 3-step convolution on disk. With such a headache involving disk access, it only made sense that the existing multiple hard drive support (in Basic Swap Mode) was extended to include the large swap computations (Advanced Swap Mode). And as such, a software raid layer was built into the program that allows dynamic striping of an unlimited number of hard drives. The dynamic striping provides the flexibility of allowing the program to choose its own stripe-sizes and freely switch back and forth between interleaved striping and append striping. Although currently not used, this will allow the program to optimally select the trade-off between fast sequential access (interleaved striping) vs. fast strided access (append striping). For this particular computation, only 4 hard drives were used - which could have easily been combined using hardware Raid 0. But in the interest of testing the program's multi-hard drive feature, the 4 hard drives were kept as seperate logical volumes. In addition to vamping up disk bandwidth by cramming in more hard drives, overclocking was used to speed up the computer and further increase its computing potential. With 4 hard drives and nearly 500 MB/s of disk bandwidth, swap computations even at this size are no longer dominated by disk access. In fact, more than half of the actual run-time is spent limited by CPU and memory rather than disk. 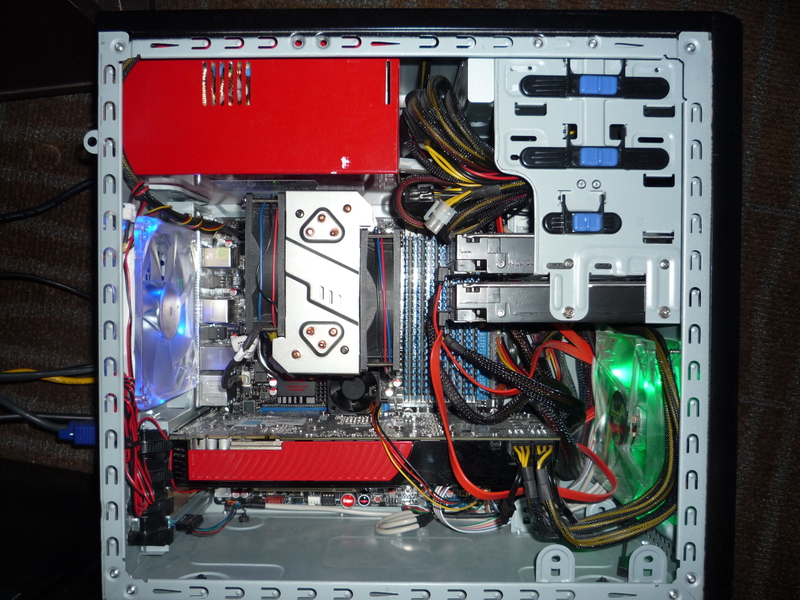 Therefore, overclocking is a worthwhile option to further increase performance. For this type of application, a lot of effort is usually put into squeezing out every last percent of performance from the software. However, many fail to realize that the hardware can be a great opportunity for improvment as well. With the right tools and skills, it is usually possible to squeeze out a generous amount of performance out of the hardware. To make matters worse, this type of computation does not tolerate errors of any kind. Even though there is error-correction built into the program itself, it is best to not rely on it since most instability will usually result in a BSOD or a system crash of some sort - which the program cannot recover from. However, overclocking when done properly can be as stable as an non-overclocked system. It can therefore be an effective way to increase the performance of a system without any expensive hardware upgrades. It does, however, void the warranties of the hardware. But rarely is that a problem since (most) computer hardware will last much longer than their warranties when given enough care. There are many reasons to this - many of which are obviously proprietary. But one of the more common reasons is simply heat. So every degree increase in sustained operating temperature can drastically reduce the life of the processor. And conversely, reducing the sustained operating temperature can exponentially increase the life of the processor. By investing in some of these after-market coolers, it is possible to reduce the temperature of the processor enough where it can be safely overclocked with little or no adverse effects. I should note that heat is obviously not the only problem in overclocking a computer. But it is presented here a simple example of how a barrier to overclocking can be taken down with a little investment and tweaking. With only slight bumps in voltages and slightly relaxed memory timings, the system was able to pass all stability tests at 3.8 GHz for several hours. In particular, all stress tests except for Linpack were able to run for several hours without error at 3.9 GHz or higher. To ensure stability, the entire system was clocked backed down slightly (via lowering the base clock) so that the processor was down to 3.5 GHz. All other settings (including voltages) were kept constant. This effectively provided a 300 MHz safety margin for which ensure stability. Overclocking the memory from 1066 MHz to 1333 MHz followed a similar process. Except that very little safety margin was used since the memory was "rated for overclock @ 1333 MHz under the right conditions". The uncore frequency was also overclocked (from 2.17 GHz to 2.83 GHz) using the same standard overclocking techniques. It should be noted that this overclock was not done soley for the purpose of this computation. The computer had always been running at 3.5 GHz (or higher) since the second day it was built (July 2009). Since then, the computer has been put under extremely stressful workloads for months at a time at 3.5 GHz, and 3.8 GHz. Not once has a single error or crash ever occur at 3.5 GHz. And only once did 3.8 GHz fail (resulting in a BSOD), but that was during the first week of testing it when no safety margins were applied yet. There have been multiple instances where the cpu was clocked to 4.2 GHz and higher, but none of those sessions were sustained for more than a few hours due to overheating issues. Hence, the processor is clearly capable of much higher frequencies if overheating wasn't a problem. The final frequency was set at 3.33 GHz (3.5 GHz turbo boost) - which is a 25% increase from the default frequency of 2.66 GHz (2.80 GHz turbo boost). This effectively made the processor run slightly faster than the much more expensive Core i7 Extreme 975 - which runs at 3.33 GHz (3.46 GHz turbo boost). At 3.5 GHz, the load temperature of the hottest core ranged from 70C - 76C in slient mode (all fans to minimum) and 65 - 70C in normal mode. These corresponded to ambient temperatures of roughly 73F - 80F. Despite all the drawbacks of overclocking, I find that debugging hardware instability is no different from debugging multi-threaded code. The original plan was to attempt 1 trillion digits using the same workstation that was used in last year's computations. 750 GB + 4 x 1 TB HDs with 400MB/s total disk bandwidth. But technical difficulties along with being far away from home (and no physical access to the machine), meant that I could not use my workstation for such a computation until at least Spring Break. So the only other option was to use the next best computer I had, my overclocked desktop. Since this desktop was my primary programming box and entertainment center, It would have been quite problematic to tie it down for an extended period of time.